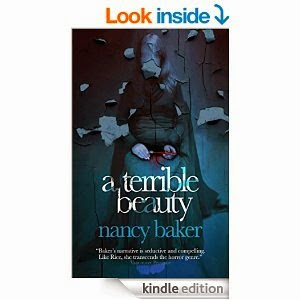 In A TERRIBLE BEAUTY (1996), Canadian vampire author Nancy Baker adapts "Beauty and the Beast" with the sexes reversed in a modern setting, the wilds of Canada. A dying professor, Simon Donovan, gets a letter from Sidonie Moreau, a woman from his past whom he hasn't seen in decades. She wants restitution for the wrong he did to her. Simon confesses to his sons that Sidonie had served as his research assistant on a project involving esoteric documents. They had shared a brief love affair, while she did most of the work in unraveling the scholarly puzzle that had baffled him. Then she had mysteriously vanished from the university, with no record of ever being enrolled. Simon published the work without giving her credit, and now she demands that he visit her to deliver some unspecified compensation. Simon's youngest son, Matthew, a penniless artist, makes the journey in his father's place, just as Beauty in the fairy tale offers herself to the Beast to save her father. Matthew travels to the distant northern forest, where Sidonie Moreau lives on an isolated island. There he meets a young woman who claims to be the daughter of his father's old lover. She dwells in a huge mansion with many locked doors and no mirrors. Inhabitants of the nearest village, two of whom work for her, avoid answering his questions. Soon enough, of course, his hostess reveals herself as the original Sidonie—a vampire. Two thousand years old, she is the only surviving native speaker of the language she helped his father translate. In payment for his father's betrayal, she requires Matthew to stay with her until she chooses to let him leave. Each night, she will ask him the same question: Will he give her his blood, even though the donation might kill him? He wonders, since she can feed on the blood of animals, why does she need his? Eventually scenes from her viewpoint reveal to the reader (but not to Matthew) that she cherishes a secret belief about the benefits of blood freely offered, not taken by force or seduction. Although a figure of allure and pathos, Sidonie also projects an aura of danger. She has killed human victims in the past, and she doesn't let Matthew forget what she could do to him and his family if he defied her (though at first her threats focus more on disgrace and ruin than physical violence). Once she allows him to see her true self instead of the human mask, her beauty has an alien quality he can't ignore. After futile attempts to find her daytime resting place or to escape, he resigns himself to remaining her prisoner until his death. When a small group of other vampires comes to visit with their mortal slaves, Sidonie appears benign in contrast. Little by little, as she and Matthew learn about each other's lives, his fear, revulsion, and hostility transform into friendship. He spends his free hours painting, his creativity flourishing under her influence. When he gets a letter announcing his father's imminent death, the tale plays out as we'd expect from the "Beauty and the Beast" parallel, yet with a surprise or two. This enchanting story is guaranteed to enthrall fans of either vampire romances or fairy-tale retellings.